Nemasys® Biological leatherjacket killer controls newly hatched larvae that attack grass roots resulting in slow growth and yellow patches on lawns. Leatherjackets are the soil-dwelling larvae of the crane flies commonly known as daddy longlegs. There are many species of daddy longlegs, but most tend to appear towards the end of August and lay their eggs within days. Once they hatch, around two weeks later, the legless creatures begin to feed on grass roots and stem bases, devastating lawns and plants. Nemasys® Biological Leatherjacket Killer is a safe and effective way to deal with a leatherjacket infestation, which can only be treated using biological methods in most of Europe. What is Nemasys® Biological Leatherjacket Killer? 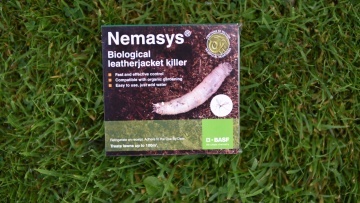 Nemasys® Biological Leatherjacket Killer contains beneficial nematodes (naturally occurring microscopic worms) which seek out and kill leatherjackets. Nematodes attack the pest by entering natural body openings, releasing bacteria that stop the pest from feeding, which quickly and safely kill it. The nematodes then reproduce inside the dead pest and release a new generation of hungry nematodes, which disperse and search for further prey. Apply nematodes two weeks after you see a peak of crane flies. August to October applications control most problematic leatherjacket species. Mix the Nemasys® with water (following the pack instruction) and apply immediately using a watering can or garden hose applicator, to already moist lawns, when the soil temperature is above 10°C. Straight after application, water the grass well so that the nematodes are washed into the soil where the leatherjackets live.